Today is Earth Day. In fact, today is the 50th anniversary of Earth Day. Back in 1970, the world woke up to the fact that mankind was destroying the planet. Horrible smog covered many major cities. Rain forests were disappearing. The hole in the ozone layer was getting bigger. And many animals were on the brink of extinction. 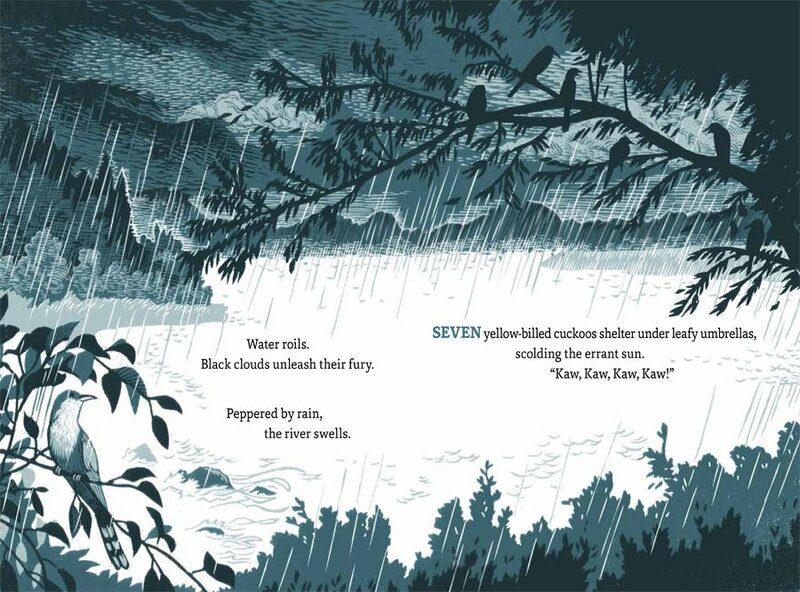 Interior art of stormy landscape with cuckoos from Four Otters Toboggan written by Vivian Kirkfield and illustrated by Mirka Hokkanen, Pomegranate Books ©2019. Back in 1970, I was a young woman teaching kindergarten in the New York City public schools. 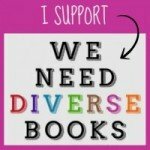 I knew that picture books were a wonderful way to educate, entertain, and inspire young children. But what I didn’t know then was that I would write a book to aid in our quest to protect the environment and save the species. In those days, I often accompanied my husband on his fly-fishing expeditions to pristine mountain streams in the back country of whatever state we lived in at the time. These were areas not yet touched by residential and industrial development. And when I’d grow weary of casting the rod, I’d sit on a rock and be still … so still that after a while, woodland creatures would venture out. In Colorado, otters splashed, falcons circled, and butterflies would flit, flutter, and hover, sipping nectar from wild columbines. I knew then that one day I’d write a story about them, a story that would encourage children and their parents to cherish wildlife and protect their habitats because a world that is safe for wild animals is safe for human beings. 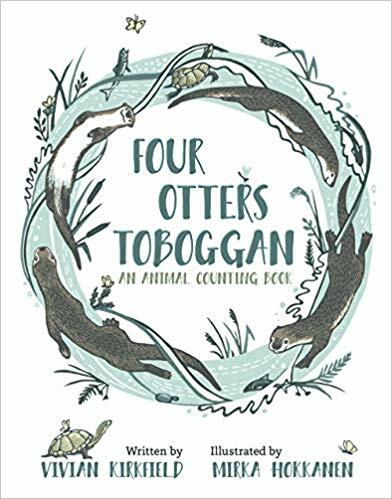 FOUR OTTERS TOBOGGAN: AN ANIMAL COUNTING BOOK (Pomegranate, Ages 5-8) introduces children to ten endangered animals: river otters, Peregrine falcons, fritillary butterflies, yellow mud turtles, and more. The text is lyrical yet simple enough for the very young. And the illustrations are fabulous original woodcuts by the talented artist Mirka Hokannen. The rich STEM back matter contains facts about each animal and also information about protection of these species and what factors threaten them. 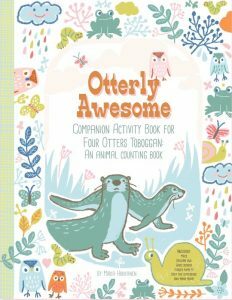 There is also a wonderful activity book created by the illustrator, available here for free download. 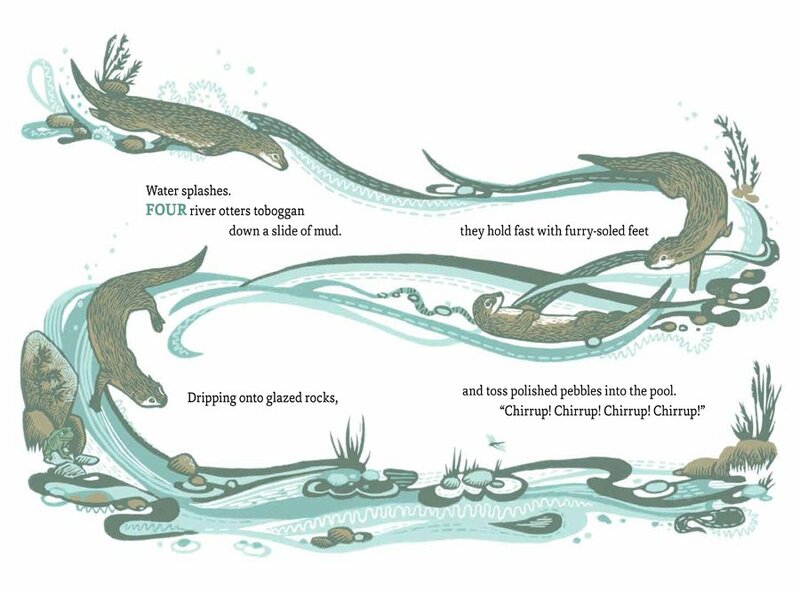 Interior artwork from Four Otters Toboggan written by Vivian Kirkfield and illustrated by Mirka Hokkanen, Pomegranate Books ©2019. Although much work has been done over the last fifty years, there is still so much more to do if we are to leave a legacy of clean water, fresh air, and a healthy planet for our children and for all of the species that live here. Because there is a chain of life that connects us all and, if even one species is threatened, we humans are threatened as well. Thank you so much, Ronna, for giving me the opportunity to shout out about EARTH DAY and about FOUR OTTERS TOBOGGAN. We only have one planet – and we need to take good care of it and all of its inhabitants. 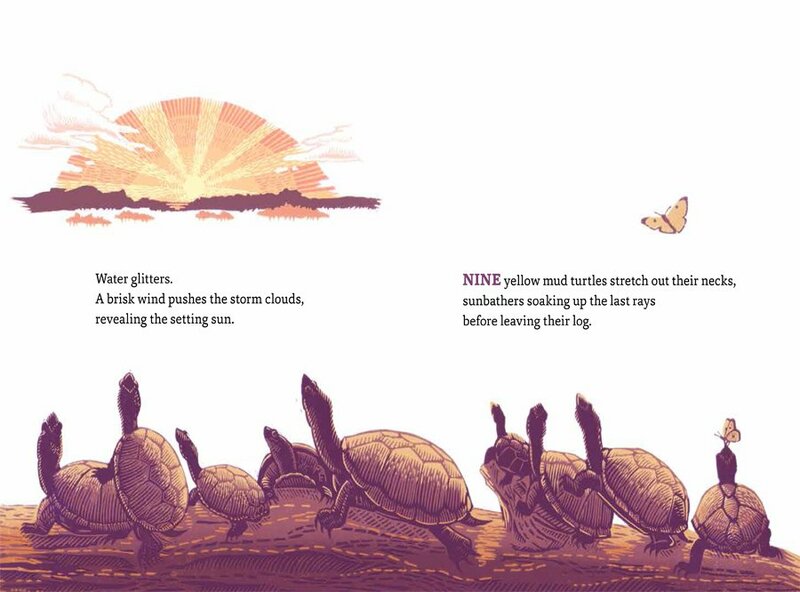 Interior artwork of turtles basking in sun from Four Otters Toboggan written by Vivian Kirkfield and illustrated by Mirka Hokkanen, Pomegranate Books ©2019. A huge thanks to Vivian for writing her charming picture book and for this enlightening guest post. As global citizens, we are custodians of our world and must pay attention to the signs all around us that climate change, waste, pollution, and the poisoning of our waters with plastics and chemicals will not go away just by wishing it so. Click here for another Earth Day book suggestion. 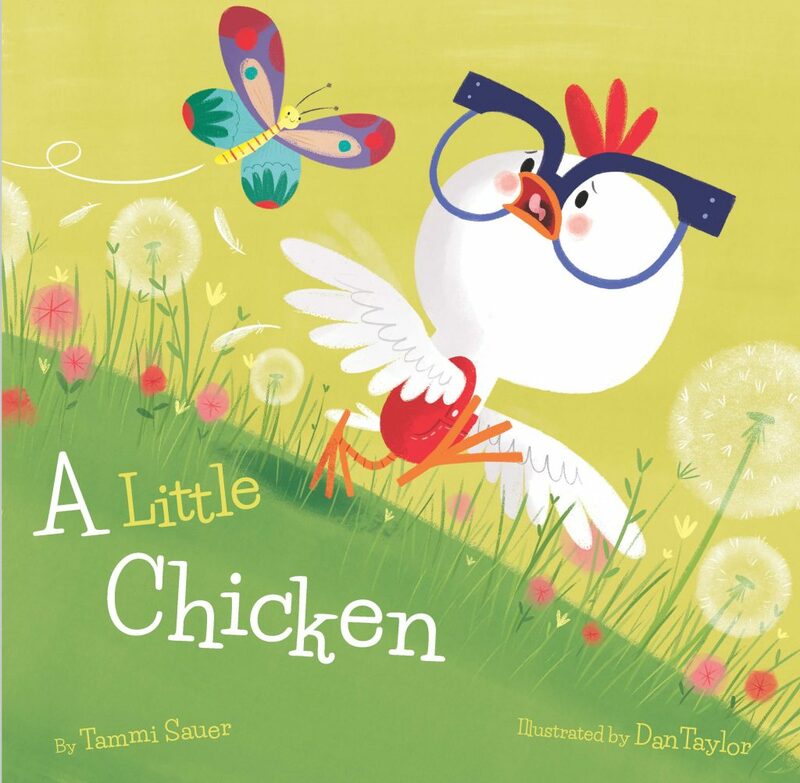 If your child enjoys sweet, pun-filled, read-aloud stories with an enjoyable mix of humorous artwork, a relatable subject and “the occasional lawn ornament,” pick up a copy of A Little Chicken to meet adorable Dot. While not all poultry are petrified of every little thing, Dot sure is. From Taylor’s very first illustration in this picture book, readers will see from her school photo that Dot, the chicken, is being frightened by a spider. (NOTE: don’t miss the end papers.) She was indeed a scaredy cat chicken. Wolves, bears and even a lovely, fluttery butterfly terrified her. 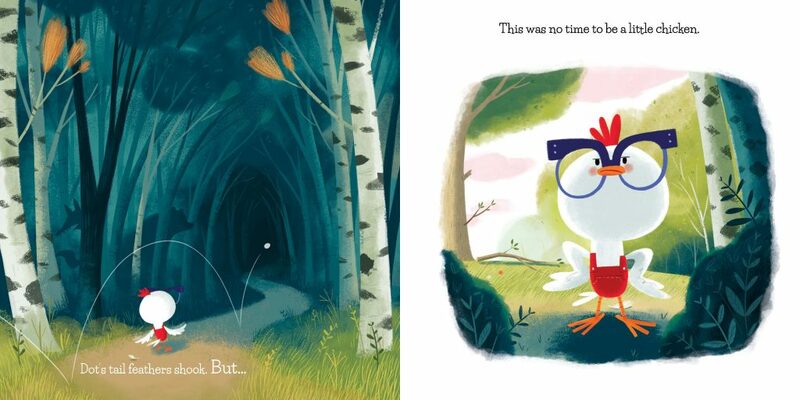 Interior artwork from A Little Chicken written by Tammi Sauer and illustrated by Dan Taylor, Sterling Children’s Books ©2019. Things went from scary to hairy pretty darn quickly when one day Dot knocked an egg out of the coop. Of course this was unintentional, but regardless, she couldn’t let her “soon-to-be sibling” roll away. Dot dashed for the egg but it remained just out of reach with funny obstacles around every corner. As the egg’s momentum carried it off towards the deep dark woods, Dot had to decide if she had it in her to brave the unknown. Was she more than fluff? ABSOLUTELY! She may have been a little chicken but she also knew what mattered in life. This highly readable, entertaining picture book is perfect for parents prone to making sound effects. It cleverly lets youngsters know it’s okay to have fears but facing them may sometimes yield amazing results, in this case a precious baby sister. Author Tammi Sauer’s chosen to focus on fear in a way that honors this feeling and provides an easy in for a discussion about this topic with children. The story flows smoothly and little ones will be rooting for Dot along with her farmyard fan club. Sauer’s wonderful way with words is evident in A Little Chicken and she uses all the right ones though quite economically because Dan Taylor’s hilarious illustrations say so much. All the animal characters that inhabit Dot’s world are not scary nor are the lawn ornaments. In fact, I rather hope they’ll make an appearance in another story. Definitely take a crack at this recommended read! Click here to read a review of Tammi Sauer and Dan Taylor’s But The Bear Came Back. 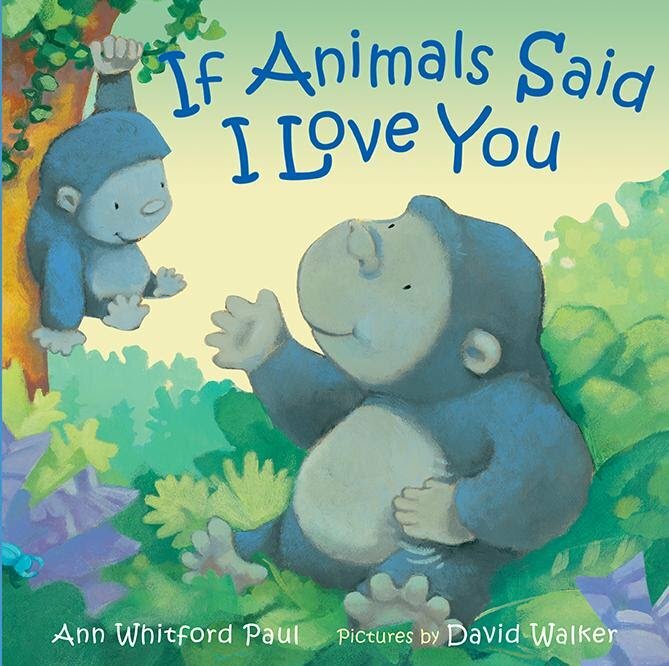 If Animals Said I Love You is a charming and worth-waiting-for companion to Ann Whitford Paul’s and David Walker’s If Animals Kissed Goodnight, and this new bedtime tale does not disappoint. 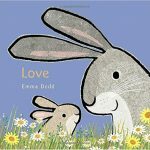 There are lots of different ways that animals say I love you to their family and friends, and young readers will welcome how creatively they show their love any time of day or night in this picture book. 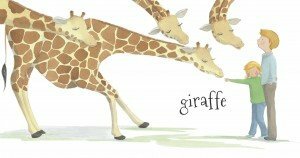 Although the story’s star is Gorilla who appears several times throughout the book in addition to being featured in the beginning and end, children will also get to meet nine other animals including Whale, Boa, Lion, Secretary Bird, Cheetah, Spider, Ostrich, Impala and Alligator. 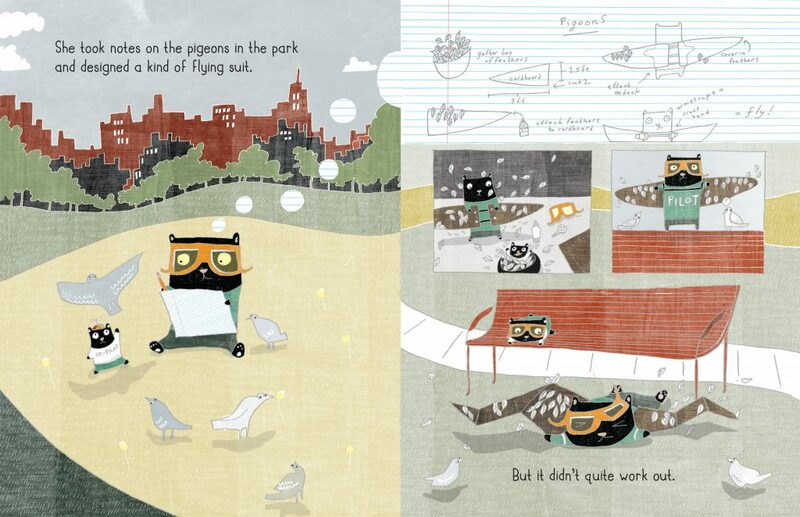 Interior spread from If Animals Said I Love You written by Ann Whitford and illustrated by David Walker, Farrar Straus Giroux ©2017. Each individual animal grouping demonstrates its love in a unique way, one that youngsters will want to imitate whether that be the slap-slap chest pound from Gorilla or the big tail swish and shower splashity-splish of Alligator. Paul’s lyrical text is playful and inviting. It’s hard to resist repeating the whappity-whaps, click-clacks and heapity-heaps. Walker’s soothing artwork is a sweet accompaniment to Paul’s well-paced rhythm and rhyme. His animals are adorable and endearing and never stagnant until the closing spread seen below. From twisty Boa to leapity-leaping Impala, these animals’ motions move the reader to turn the page for another new treat of words and illustrations. If Animals Said I Love You may be packed with tons of heart-warming animal love and affection, but rest assured, there’s always room for more hugs and kisses and I love yous at the end as you tuck your own little one into bed. Read another bedtime story review here. 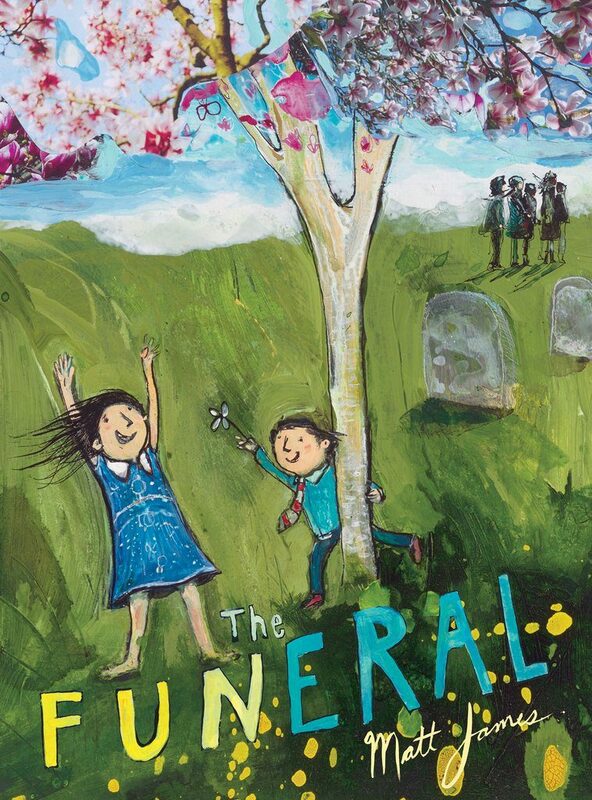 Matt James’s forty-page picture book, The Funeral, opens with a ringing phone at Norma’s house. A few days later, her family’s going to great-uncle Frank’s funeral. Norma has to practice her sad face in the mirror because, in actuality, she’s thrilled to miss a day of school and see her favorite cousin. 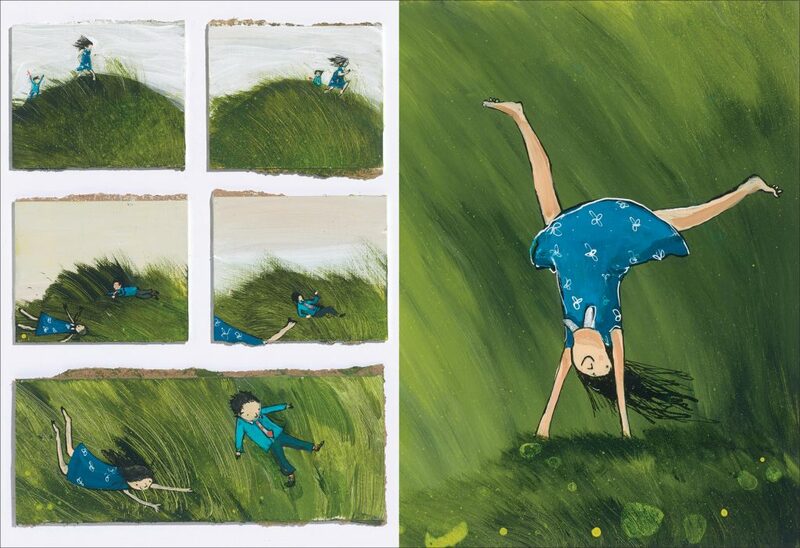 While the text engages our senses, the vivid illustrations capture the story’s emotional heart. In church, grays contrast with the bright colors of the stained-glass windows, “swirling song” of the organ, and familiar smell of Norma’s mom’s purse. The acrylic and ink art on Masonite has a layered qualify because of dimensional elements made from cut paper, masking tape, rolled-up twine, cardboard, and scroll-sawn Masonite (all painted with acrylic). Interior illustrations from The Funeral written and illustrated by Matt James, Groundwood Books/House of Anansi Press ©2018. This exploration of a funeral from Norma’s viewpoint demonstrates that, while she does reflect on the gravity of the occasion, it’s the details adults may take for granted that influence her perceptions of this unusual day. The girl’s wondrous childhood curiosity allows for philosophical questions alongside simple acts of fun. Read another recent review by Christine here. 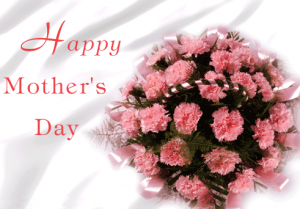 How do you celebrate Mother’s Day? 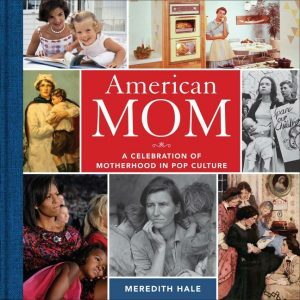 With our recommendations for the best new Mother’s Day books around! And, whatever you may do, wherever you may go, take some time to read together with your children at home, in a park, on a train, at a bookstore or in a library. Books make memorable gifts and, with an added personal message, will be cherished for years to come. In A Heart Just Like My Mother’s, when Anna, who loves and admires her mother is inspired to help a homeless man by saving up her Tzedakah money, she realizes she and her mom share something in common—a big heart. This lovely picture book is a wonderful way to explain the Jewish tradition of performing an act Tzedakah which Nargi defines not so much as charity but doing the right thing by helping others. But it’s also the story of a little girl who starts out thinking she could never be as creative, funny or caring as her mother until she realizes what she has to offer. By collecting Tzedakah money and providing food for the homeless man, Anna’s selfless act of kindness brings her closer to her mother and proves to herself that she too has qualities worth being proud of. I love Cis’s illustrations too. There’s a warm, folksy feeling about them that adds to the positive vibe that emanates from the pages making A Heart Just Like My Mother’s such an enjoyable read. 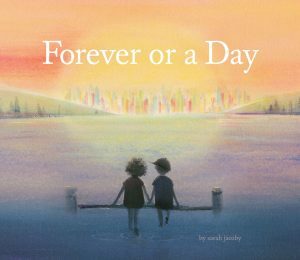 With its starred reviews from both School Library Journal and Publishers Weekly, Forever or a Day by Sarah Jacoby will make a thoughtful gift this holiday for those seeking something at once out of the ordinary as well as heartwarming. It conveys its beautiful message with spare yet evocative text and in just 20 pages. At first I thought it was a picture book about the future, but then it dawned on me that it’s about being present and spending time together with loved ones and making meaningful moments now. Adults and children may experience different reactions when reading the book but that’s to be expected. Sophie Blackall, Caldecott Medal-winning and New York Times–bestselling illustrator of Finding Winnie, says it best: “Sarah Jacoby’s ethereal exploration of time rushes like a passing train, shimmers like a setting sun and allows us, just for a moment, to appreciate the beauty of standing still.” Prepare to be moved by the compelling art that complements the lyrical language of Forever or a Day. 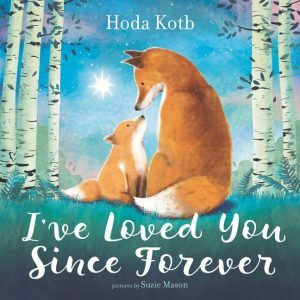 Precious pairings of mothers and and animal babies from bluebirds and bunnies to otters and owls fill the pages of Today show co-host Hoda Kotb’s debut picture book, I’ve Loved You Since Forever. Kotb adopted her daughter, Haley Joy, in February 2017 and her happiness at becoming a mother is infectious and evident throughout this delightful picture book. 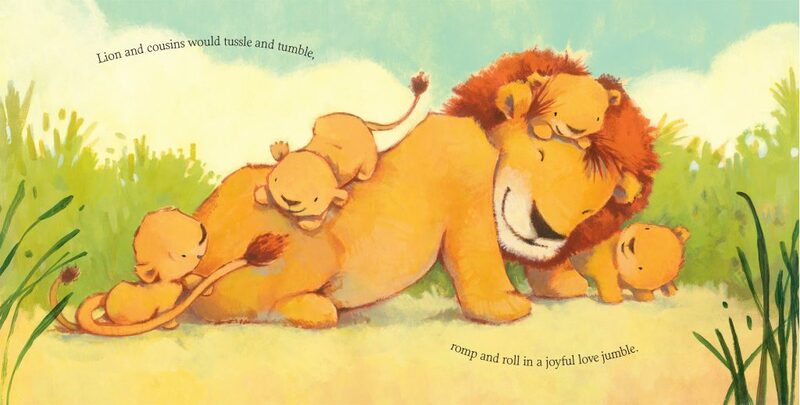 Gentle rhyme, a repeated refrain (there was you … and there was me), a rewarding wrap up and exuberant illustrations all work wonderfully together. I’d pick up I’ve Loved You Since Forever for any new parent on your holiday list. In addition to Kotb’s lovely language, there’s a sense of warmth and closeness from the special bond of parenthood depicted in Mason’s tender scenarios. Whether or not you’re an adoptive parent, I’m sure these lines will resonate with you as they did with me: Before otters swam together/and rivers reached the sea/there was you and there was me/waiting for the day our stars would cross/and you and I turned into we. Awww! In 176 color pages and 12 clever chapters, author Hale deftly delves into the world of motherhood from various perspectives that readers will find fascinating. The introduction says the book “explores the changing role of motherhood through the images and shared cultural moments that have captured it best: magazines, advertisements, greeting cards, television shows, movies, songs, and other pop culture ephemera.” Choose a chapter at a time because this comprehensive and enlightening book is meant to be savored slowly (like a 1950s TV mom’s best casserole) and cannot be read in one or even two sittings. I love the breadth of the material that’s been included and am partial to the earlier chapters that cover motherhood in the eras before I was born including The Nineteenth Century, The Pre-War Years, World War I, The Roaring Twenties, The Great Depression, World War II, The 1950s (although note that American Mom does go all the way to present day 21st century). I learned, for example, that between “1885 and 1905, there were around eleven thousand magazines and periodicals published in the United States—and about 88 percent of the subscribers were women,” that Betty Crocker was a fictional character, that Eleanor Roosevelt “broadened the role” of first lady and that on I Love Lucy they couldn’t say the word pregnant on the show! Through Hale’s insightful lens on motherhood, we’re taken on an entertaining jaunt through fashion, food, first ladies, feminism, photography, film and literature that pays tribute to the ever changing role of mothers in American life and touches on aspects of this expansive topic in ways that will interest every reader, male or female. 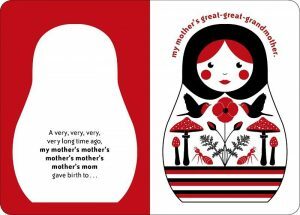 Simple in concept, but rich in design elements, this 14-page board book is perfect for little ones who adore the pull-apart Matryoshka dolls. Every other page takes a child back several generations of a mother’s mother’s mother’s mother who in turn gave birth to a child eventually bringing the reader to the present. “And not long ago, I gave birth to you … my very own child. A mother’s love goes on and on and on.” What a beautiful sentiment to share with a young child while cuddling them close and showing them all the different colored pages, each with unique and nature-inspired artwork. There’s also a version for dads! Read our Mother’s Day recommendations from 2017 here. Read Cathy Ballou Mealey’s review of Love, Mama here. is reviewed today by Cathy Ballou Mealey. 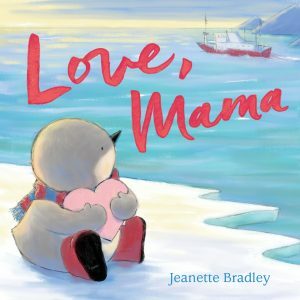 A mother’s temporary absence feels unfamiliar, deep and distant for young Kipling, a fuzzy penguin starring in author-illustrator Jeanette Bradley’s debut picture book Love, Mama. As Kipling waves goodbye to his Mama, floating toward a ship with her rolling luggage and travel satchel, she promises to come home soon. But what does “soon” mean for Kipling if Mama is not back by dinner, or bedtime, or even the next morning? Although another parent penguin has remained at home, the child-like penguin’s longing for Mama is powerful and pervasive. Kipling gets busy creating substitute but unsatisfactory Mamas from pillows, pictures and snow. Finally there is nothing left to do but wish and wait for Mama’s return. Then – a delivery! A special, soggy box arrives. It carries the scent of the ocean and makes a mysterious thunk-rustle noise. Mama has sent a package of thoughtful mementos and a reassuring heart-shaped note of love. Hugging the note just as Mama has done in an enclosed photo lifts the little penguin’s spirits. Soon Kipling starts to compile a similar treasure box for Mama. Bradley’s soft illustrations depict a cool grey and blue-white landscape that warms to a gentle gold glow inside the penguin home. Pops of red on boots, belts, boats and especially Mama’s glasses add just the right note of playfulness and cheer. 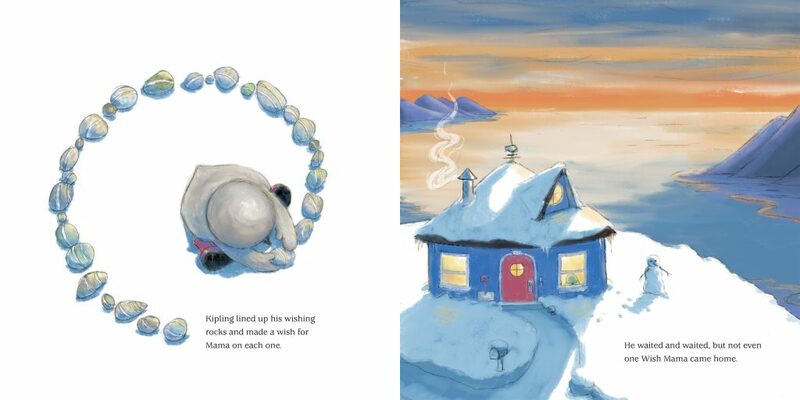 Bradley utilizes a variety of unique perspectives from land, sky and sea to help young readers imagine the distances stretching between Kipling and Mama. My favorite spread depicts the young penguin from above, plopped down in the snow, carefully arranging rocks in a circle. 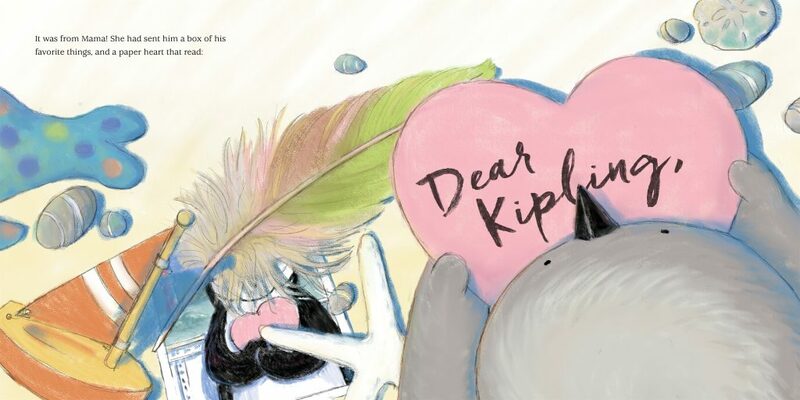 Can Kipling’s special, striped wishing stones help speed Mama’s return home? Where obtained: I reviewed an advanced reader copy from the publisher and received no other compensation. The opinions expressed here are my own. 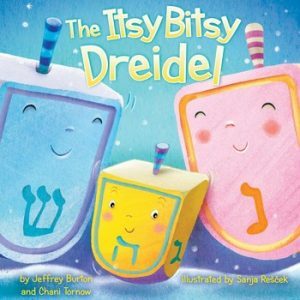 The Itsy Bitsy Dreidel, a glossyl, sturdy 16 page board book, illustrated with lush jewel tones and cheerful winter scenes, stars a charming yellow dreidel little ones will love. As the story opens the dreidel is out “for a little spin” and then heads inside as sundown arrives. Anyone familiar with the Itsy Bitsy Spider nursery rhyme (and who isn’t?) 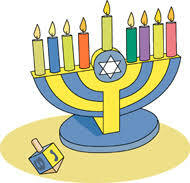 will be ready to sing along as this happy dreidel gets ready to celebrate with his family. From watching Dad cooking jelly donuts and latkes in oil to feeling awe as Mom lights the menorah, this excited itsy bitsy dreidel experiences the joy of the Jewish Festival of Lights just like young readers do every year. I love the zany tales that take place in the Jewish folkloric town of fools known as Chelm and Way Too Many Latkes is no exception. This picture book will have kids grinning from ear to ear at the humorous over-the-top antics that Faigel and her husband Shmuel get up to when she realizes that this year she has forgotten the recipe to make her delicious latkes. So what chaos ensues when Faigel hasn’t got a clue how many potatoes she needs to cook? Shmuel suggests he visit the wisest man in Chelm, the rabbi. And when the rabbi recommends using them all, the couple follow his advice. Naturally Faigel then wonders how many eggs to use and how much onion and again and again, Shmuel asks the rabbi. Soon the couple have hundreds of Faigel’s famous cooked latkes and not enough mouths to eat them. Surely the learned rabbi must know what to do with so many. While older readers and adults may know the outcome, little ones might not, only adding to the comical spirit of this satisfying story. 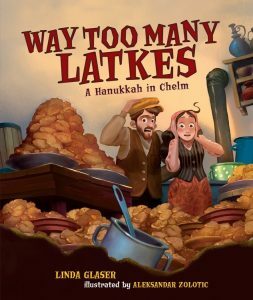 Glaser has created a tale that is filled with fun and latke love. Zolotic’s artwork of muted browns, blues, greens and grays transports readers back in time to an early 20th century Eastern European village that many of our grandparents or great grandparents would find familiar. A great Hanukkah read! I really like Little Red Ruthie, a clever new take on the fairy tale Little Red Riding Hood. Reimagining it from a Jewish holiday perspective only makes it that much more enjoyable. 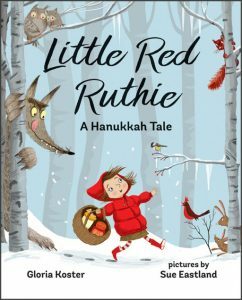 Now snuggle up with a warm cozy blanket and get ready for a cold Hanukkah day in the woods as Ruthie makes her way to Bubbe Basha’s house. It’s time for their annual latke cooking. Soon she is confronted by a menacing and hungry wolf and is forced to summon up her Maccabee courage. She spins a tale about being too skinny to eat and suggests he wait until after the holiday when she’ll be plumper. The wolf buys it, but his growling stomach gets the better of him so after she has gone, he reneges his promise. Perhaps, he thinks, a nosh of Bubbe Basha will stave his hunger off before dining on Little Red! While I would never have entered the cottage having spied the wolf inside, Ruthie does. She once again fights her fear and stalls the wolf by cooking up a batch of latkes while recounting “the tale of the Maccabees’ victory.” As we all know, latkes can be very filling and sleep inducing. Before long the intruder has reached latke capacity and yearns for some “fresh forest air.” After the wolf’s departure, both Little Red Ruthie and Bubbe Basha can at last relax while relishing the first night of Hanukkah and all the remaining latkes. Sure to be a hit with the 4-8 crowd, Koster’s fractured fairy tale delivers all the treats of the original story and includes some fun new tricks, too! Eastland’s illustrations are charming and capture Little Red’s plucky personality to a laTke! 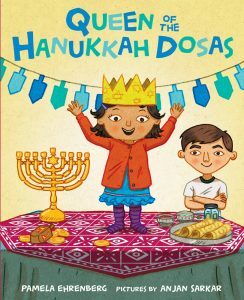 Author Pamela Ehrenberg’s engaging new picture book called Queen of the Hanukkah Dosas celebrates siblings, diversity and the joyous role traditional food plays in different cultures, in this case Indian. With Hanukkah approaching as the story opens, an older brother narrator describes his younger sister Sadie’s penchant for climbing, even in the Indian supermarket. Fortunately, his version of the dreidel song succeeds in getting her to climb down. “I had a little dosa; I made it out of dal.” By page three readers learn the family is a blended one with an Indian mom and Caucasian dad. Rather than making latkes together, this family prepares dosas, a crispy pancake popular in South India that’s cooked in coconut oil. When everyone except a napping grandmother gets locked out as cousins arrive, Sadie’s climbing capability comes in handy. Colorful artwork complements this entertaining story and readers will easily smell the food cooking with each page turn. Recipes for dosas and the sambar served with it are also included. Read my interview with author Pamela Ehrenberg on page 28 in December’s JLife magazine by clicking here. Meet Dreidel Dog, the newest member of the Hanukkah family. Find him happily at home beside The Mensch on a Bench. 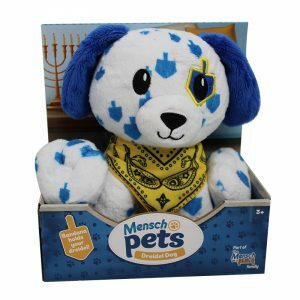 Mensch’s best friend makes a perfect plush companion when giving The Itsy Bitsy Dreidel or any of the other terrific Hanukkah books reviewed here. Whether it’s for Hanukkah or for a Bark Mitzvah, this cuddly, dreidel-spotted Dalmatian is the perfect gift on its own or paired with a book. Plus, this cute canine’s bandana even has a secret pocket to hold your dreidel! Adopt your own Mensch pet today. Find more info at www.themenschonabench.com. Click here to see reviews of Hanukkah books from 2016. As a preschool teacher, it is not lost on me when a child has a BIG idea, but may need some help executing the plan. 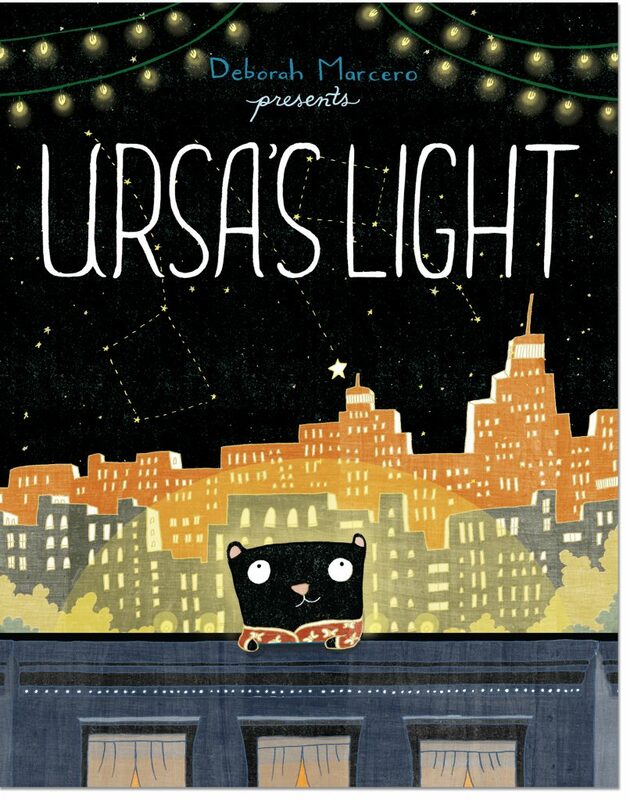 Ursa’s Light, the debut picture book by author and illustrator Deborah Marcero, is about a young bear, Ursa, who has BIG ideas that often leave her peers and parents scratching their heads in wonder. Ursa the bear knows that she is meant to FLY. She studies animals and planes in flight, intent on finding a solution, often encouraged by her baby brother. Just when she is about to give up, we discover that she was indeed meant to fly, but there is more than one way to SOAR. Interior spread from Ursa’s Light written and illustrated by Deborah Marcero, Peter Pauper Press ©2016. One of my favorite moments in the story is when Ursa’s failed attempts at flying make her doubt herself, and her baby brother is wearing a shirt that reads ‘believe.’ What a beautiful moment, and something I strive to teach my kids, when one of us is down, someone else can help lift us UP. What is so brilliant about Ursa the bear, is that she isn’t attempting to outshine anyone; instead, she is allowing her unique inner light to pour out, inspiring not only her baby brother, but everyone around her. I fell in love with the energy and emotion of the illustrations which Marcero’s website describes best here: “When the pencil is done… I ink the lines in and add color with all the media I had used all along : woodblock cuts, watercolor, gouache, ink wash, etc. But instead of meshing everything together on paper with scissors and glue, I taught myself how to collage them in Photoshop. Ursa’s face is that same woodblock cut as my very first piece above, and all the textures and colors I integrate are things that I come up with using brushes and inks and watercolors on my drawing table.” I hope it’s obvious how much I adore this book and can’t wait to bring in Ursa’s Light for my preschoolers! I have a feeling they are going to want me to help them fly too! 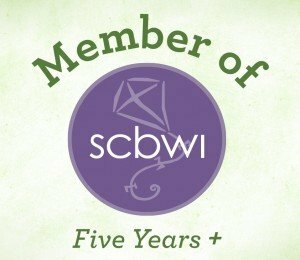 Reviewed by Ozma Bryant, our newest reviewer. To learn more about Ozma, please click here. HAPPY BOOK BIRTHDAY TO RENATO AND THE LION! 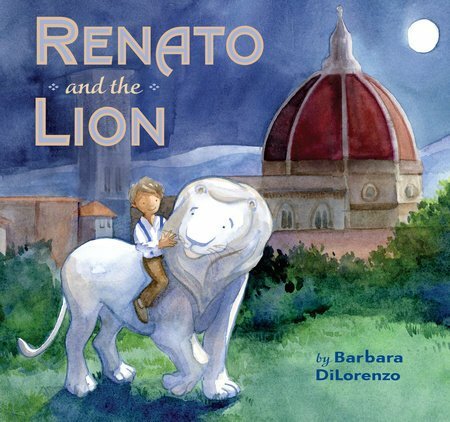 Barbara DiLorenzo’s historical picture book, Renato and the Lion, captures a young boy’s fondness for a stone lion. The story is set during World War II and Renato’s father cares for sculptures in a museum. When foreign troops arrive in Florence, he safeguards the art in brick enclosures. However, Renato’s beloved sculpture resides outside in the Piazza della Signoria where he likes to play soccer with his friends. Using some spare bricks, Renato tries to protect his lion too, but falls asleep while hiding from soldiers. The lion magically transports Renato home. Interior spread from Renato and the Lion written and illustrated by Barbara DiLorenzo, Viking BYR ©2017. Years later in the U.S.A., Renato shares this tale with his granddaughter and soon after travels to Italy where he is reunited with his long-lost lion—a reminder that powerful connections with pieces of art transcend continents and generations. DiLorenzo’s beautiful watercolor paintings bring Renato and the Lion to life. This visually stunning story enchants as it gently educates. The emotional resonance evokes a timelessness that will charm children with its quiet and heartfelt message. Find more info about Barbara DiLorenzo by clicking here. 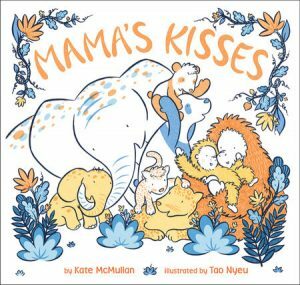 With starred reviews from both Publishers Weekly and Booklist, Mama’s Kisses is sure to be an in-demand picture book for many Mother’s Days to come. McMullan has written a sweet ode to the unwavering devotion and patience of moms, in this case, rainforest moms. The moon is on the rise and four mommy animals are on the lookout for their young ones, a baby panda, elephant, orangutan and leopard. As bedtime beckons, the babies engage in a playful game of hide-and-seek that seems so successful until all at once, when the moms are ready, their hiding place is uncovered. But being found means getting kisses, smooches, and hugs galore until tired eyes can no longer remain open. Dreamland is drawing nigh so the baby animals go to sleep soon followed by their tired moms, always close at hand. 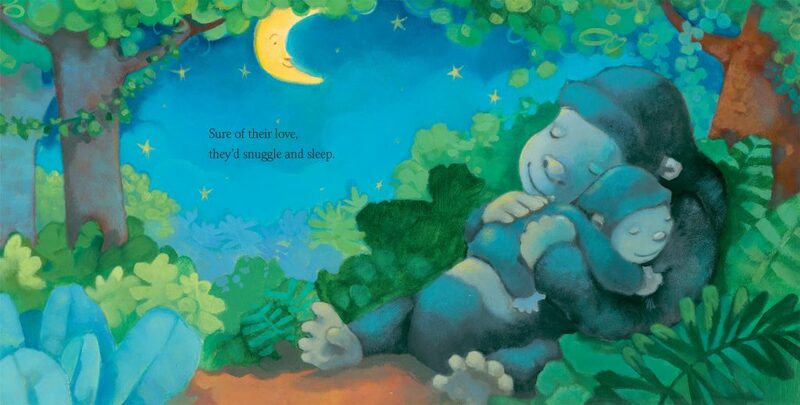 Conveyed in uncomplicated rhyme and calming rhythm, Mama’s Kisses is a gentle bedtime tale perfect for pre-schoolers. Nyeu’s artwork fills all corners of most every page and, though using only oranges, yellows and blues, she manages to create a subtle softness, warmth and calming mood with just these few well chosen hues. 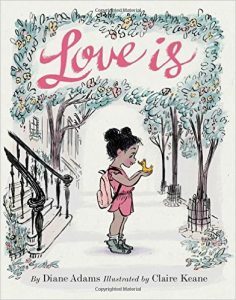 Whether it’s for Mother’s Day, Valentine’s Day, Graduation or simply just because, Love is by Diane Adams will make a great gift. Love is a girl and her duckling. Looking after the fuzzy little creature is not unlike a mother caring for her child which is why Love is works on many levels. It’s a story about loving and nurturing something that is dear to you, as well as being about the responsibility involved in such a privilege. “Love is holding something fragile, tiny wings and downy head. Love is noisy midnight feedings, shoebox right beside the bed.” The little girl must also accept that her duckling is growing. She will soon need to allow her pet to move on, fend for itself, find a new home and start a family all its own, all the while knowing that the love she has shared will not be forgotten. This 32 page picture book is a delightful read aloud story with well-paced rhyme and evocative illustrations that, coupled with the meaningful verse, will tug at your heartstrings. 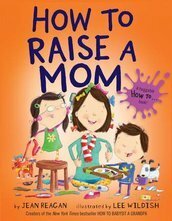 Another winner from the creators of the How To picture book series, How to Raise a Mom will totally charm moms, dads and kids alike. “Raising a happy, healthy mom is fun … and important! Are you ready for some tips?” The sibling narrators take readers through their mother’s typical day as part of their instruction guide, and clearly based on the wonderful rearing and love they’re getting from her. After kisses to awaken her, and giving her choices for the day’s outfit, the kids take her to the supermarket and the playground to name a few places while also leaving quiet time for her to get some work done. It’s fantastic to be treated again to Wildish’s whimsical illustrations like those found in the other How To books, full of humorous not-to-miss touches and amusing expressions in every spread. Kids will especially get a kick out of the dog and cat Wildish includes in many scenes. The children also cover playtime, mealtime and finish up the full day with stories and snuggles. I loved how they occasionally mimic just what Mom always says to them such as “Thank you so much, Sweat Pea, for being so patient,” or “Remember to be a good sharer!” There is so much to enjoy in this picture book tribute celebrating moms everywhere. As our nation’s 45th president, Donald Trump, is sworn in, it feels fitting to share these three presidential-themed picture books looking at all aspects of a presidency including leadership qualities, first ladies and pets. Enjoy the variety! 2. Living in an enormous house (don’t miss the shark who has just taken a bite out of Squid’s home and is quickly leaving the scene. 3. Being famous and having a book named after him. 4. Talking so everyone has to listen. But somehow the way Squid conveys those qualities doesn’t seem to go over too well with all the other fish in the sea. It takes a very little sardine stuck in a clamshell to explain the true qualities of a special leader which Squid attempts to do. Ultimately though, this all proves to be too exhausting and the way Squid sees it, it might be even better to be king! Though published last year, the tongue-in-cheek humor of this story still resonates today. Reynolds has found a fun way to help parents make kids laugh while starting the conversation about ego, leadership and character. Varon’s illustrations depicting a hot pink squid jump off the page and grab our attention just like Squid wants. One of the What’s The Big Deal About new series of books, this entertaining and informative picture book is a timely read as we welcome on the second foreign-born first lady to the White House, the first being Louisa Adams. Melania Trump is following in the footsteps of some amazing women including Martha Washington, Mary Todd Lincoln, Eleanor Roosevelt, and so many more. Author and former White House staffer (including two years working in the first lady’s office of Hillary Rodham Clinton, then leading her NY Senate office), Ruby Shamir poses a bunch of questions that kids might ask about the role of first lady. She answers them but doesn’t rely on lengthy responses. Rather she uses fact boxes to highlight some of the most meaningful and interesting contributions America’s first ladies have made. 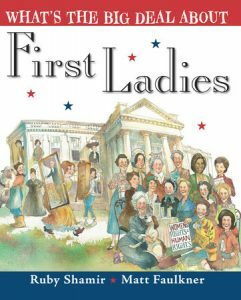 What’s The Big Deal About First Ladies helps young readers gain insight into the many responsibilities of a first lady. The following examples will also help youngsters appreciate the positive impact first ladies can make on our country: Did you know that Abigail Adams was not only a first lady but the first second lady (Vice President’s wife)? Or that Julia Grant opened up White House events to curious reporters? Or that Grace Coolidge was famous for having a pet raccoon named Rebecca, and having taught deaf children, she got her husband to pay attention to people with disabilities? Mary Todd Lincoln was the first first lady to welcome African Americans to the White House as guests. And when Eleanor Roosevelt learned opera singer Marian Anderson was banned from a concert hall for being African American, Roosevelt was instrumental in getting her to sing at the Lincoln Memorial instead! 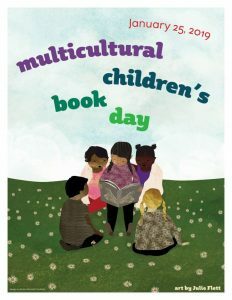 Shamir’s keen curation of which first ladies to cover invites curious children to delve deeper with additional reading. Faulkner’s artwork gives a loose interpretation of the featured women, honing in on some key aspects of the first ladies’ lives and breathing life into every scene. There’s also a handy list in the back matter of all the presidents, their term dates and the first ladies’ names that, along with the fascinating content, make this an excellent addition to any classroom or library. 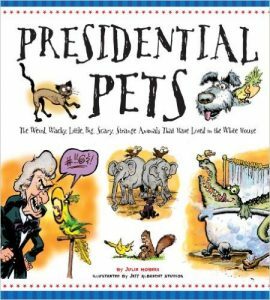 A not-to-be-missed book for Election Day 2016 and beyond, Presidential Pets is ideal for schools and homes alike. From Abraham Lincoln to Zachary Taylor, these American presidents all have one thing in common, a plethora of noteworthy pets. 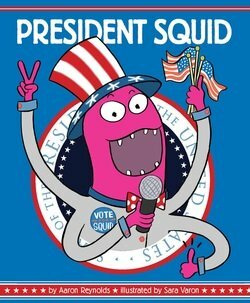 With intros in rhyme, this 95-page non-fiction picture book is filled with funny facts about presidents, their families, their pets as well as their career accomplishments. Did you know that Andrew Jackson had a cussing pet parrot who had to be removed from his funeral for her foul language? Or that Herbert Hoover’s son Allan Henry had alligators “that roamed through the grounds” of the White House? Or lastly, that Grover Cleveland, the “only president to serve two terms that weren’t back-to-back,” had a virtual menagerie of animals during his presidency including Foxhounds, Dachshunds and chickens? Moberg has done her homework brilliantly choosing an engaging and entertaining subject that brings to light all the humorous details kids and parents will love about the variety of animals and owners who once called the White House home. The cartoon-style artwork from Jeff Albrecht Studios is a whimsical addition to each presidential pet profile and is sure to bring a smile to many faces with each turn of the page. It’s not Labor Day yet! The shelves at the library and bookstore may be spilling over with “back-to-school” titles, but let’s hold on to summer silliness and camp craziness for just a bit longer. Truly, there is no one season for learning about how to tackle new experiences, face your fears and make new friends. 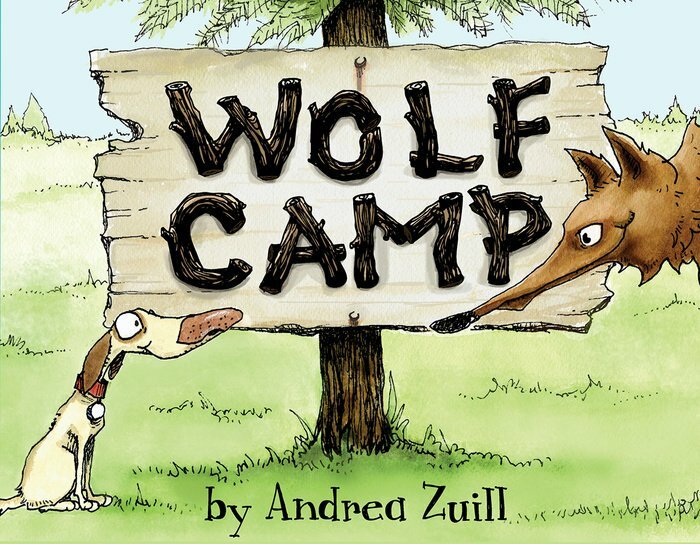 Wolf Camp by Andrea Zuill is a hilarious and heart-warming picture book that will encourage young listeners and little learners to be brave and have fun, and howl in harmony as one of the pack. Our hero is Homer, a hound dog with scrawny neck and legs, big nose and a tail that wags frantically when he’s excited. Sometimes he acts “wolfish” pouncing playfully on his pink stuffed toy moose from behind the sofa. Homer believes all dogs have a bit of inner wolf, and fantasizes about living like one of the pack, racing through the wilderness with purpose. It seems like a dream come true when an invitation to Wolf Camp (“Where every dog can live as a wolf – for an entire week!”) falls into his kibble bowl. Homer really wants to go to Wolf Camp. He pesters his human family, bringing the invitation to their attention over and over, until they relent and agree that he can go. “I’m going to be a wolf!” thinks Homer excitedly as he heads off on a big yellow bus. The camp counselors, Fang and Grrr, are actual wolves, sharp-nosed, pointy-eared, shaggy giants. Homer’s fellow campers are a bumbling, fuzzy golden retriever named Rex and Pixie, a teeny-tiny gray Chihuahua. Homer thinks the counselors seem nice, but the wolves appear slightly skeptical about the well-hidden potential in their new recruits. Nonetheless, after a detailed safety talk, the Wolf Camp lessons begin. Zuill’s pen and ink drawings with watercolor wash are zany, charming and unbelievably expressive. She masterfully contrasts wolf and dog postures and body language, perfectly positioning their poised or clumsy bodies for stalking, howling, tracking and sleeping. The animals’ eye rolls, ear tilts, and tail movements convey oodles of meaning and emotion that enrich the wry, witty text and funny speech bubbles. It’s a guaranteed giggle when Homer pens a classic camp letter to his “people” at home, complaining about the food and bugs. Wolf Camp is filled with loopy, lupine humor and heart. Readers will root for Homer, Rex and Pixie as they bond, persevere and slowly master the skills necessary for wolf-y, woodsy living. The new pack members succeed in earning Honorary Wolf certificates by the end of the week, but perhaps Homer has been changed forever by his wild experience. You’ll be howling with laughter throughout this silly, sweet and smart story for campers and canines alike. Where Obtained: I reviewed a copy of Wolf Camp from the library and received no other compensation. The opinions expressed here are my own. 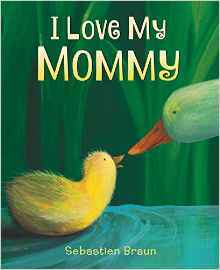 Here’s a read aloud picture book moms won’t tire of sharing with youngsters on Mother’s Day or any day. What kind of cuddle do you like best? 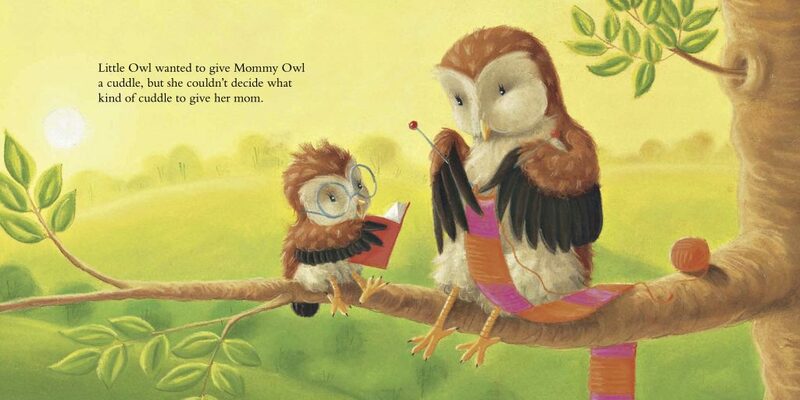 There are all kinds of cuddles and in the pages of this sweet picture book, Little Owl is wondering which one’s her favorite and decides to try them all. Mommy Owl is on the joyful receiving end of all the hugs. The good morning – a wake up time cuddle. The good-bye – a leaving for school cuddle. The “I’m sorry” – a way to apologize for doing something wrong cuddle. The “I’m scared” – when mommy’s reassuring hug helps quell fears and makes nightmares go away. There are also the thank you cuddle, happy cuddle, the proud cuddle, the “I’m sick” cuddle, and the good night cuddle. But the best kind of cuddle for any time or any place is the Mommy Cuddle “Just because I love you!” And that’s sure hard to argue with. Brown has picked cuddles for her book’s subject and it works wonderfully. 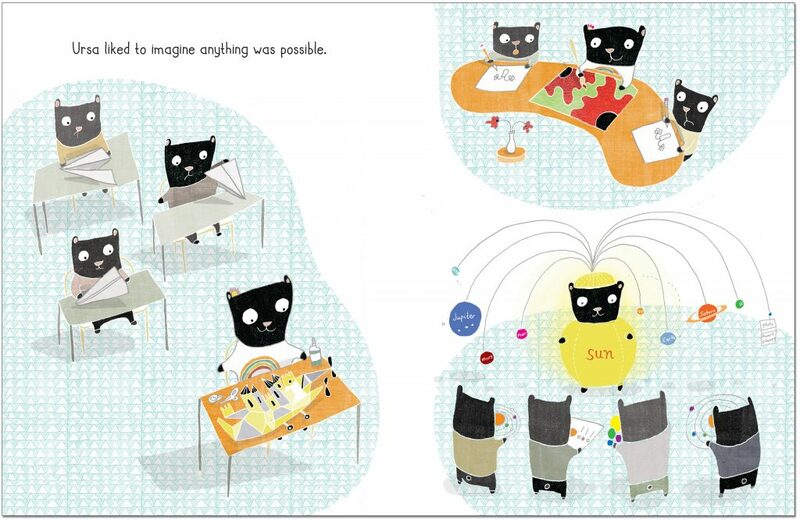 She’s created a feel good picture book that’s great for story time or bedtime. And since it’s just the right length, Cuddles for Mommy will leave lots of time for some quality cuddling at the end. I hadn’t ever considered how many cuddles and hugs we give to one another, but I’m glad Brown did. Macnaughton’s chosen a variety of background colors to highlight her illustrations that also add a cheery mood to this story. Plus, with her depictions of Little Owl and Mommy Owl, she’s found a way to make the cuddling of the two owls look believable without turning their bodies into cartoon characters. 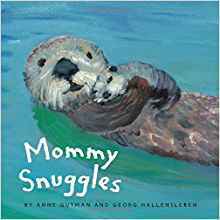 An endearing story for a special holiday, Cuddles for Mommy would make a great gift for Mother’s Day. 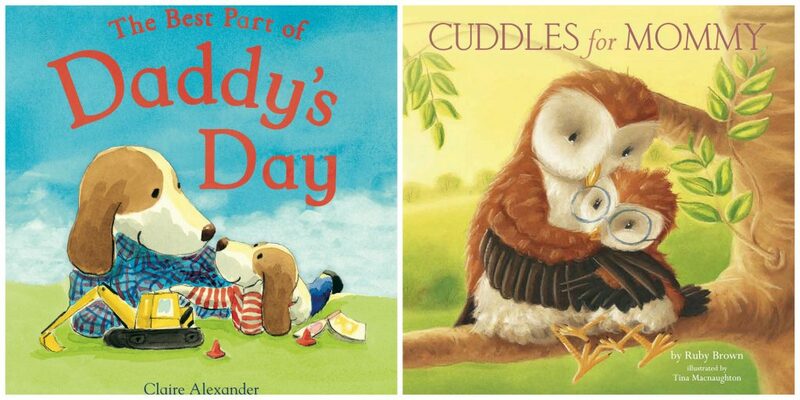 The strong message of love in both Cuddles for Mommy and The Best Part of Daddy’s Day is an important one for young readers. 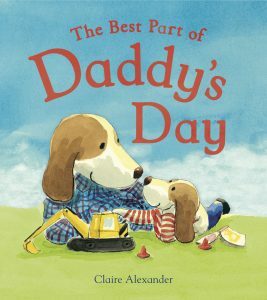 I may have guessed the ending in Alexander’s new picture book, The Best Part of Daddy’s Day, but that didn’t stop me from enjoying every page and remembering my son feeling the same way at the same age as Bertie, the narrator. Bertie wishes he could spend the day with his dad, but dad’s a builder and must make tracks to work while Bertie goes to school. Throughout the course of Bertie’s school day, he finds himself thinking about his dad and trying to recreate the experience of being a builder. Sometimes he has success and other times he doesn’t – like when a classmate gets footprints on Bertie’s artwork of a crane like the one his dad operates. The highlight of Bertie’s school day is climbing to the top of the jungle gym where he is certain he can see his dad up in the crane constructing a skyscraper. When school ends it turns out Bertie’s daddy has had quite similar experiences at his job, even spotting his son on the jungle gym! But during a bedtime story, Bertie’s dad reveals that the best part of his day isn’t actually when he’s at work. No, it’s when he comes home and gets to snuggle up close to his son. Bertie agrees that the feeling is mutual. Alexander’s written a delightful story for budding builders and those who dream of following in a parent’s footsteps. The watercolor illustrations are tender yet playful, just perfect for the subject matter. Make reading The Best Part of Daddy’s Day the best part of your day and get a copy today. Interior artwork from The Best Part of Daddy’s Day written and illustrated by Claire Alexander, Little Bee Books © 2016. We really need a Father’s MONTH or even more to celebrate all the amazing things that dads do. That’s why Good Reads With Ronna dedicates this post to fathers everywhere and the kids who love them. Incidentally, this year I noticed a new theme pop up in some of the picture books I’m reviewing. It’s noises, the kinds that dads make. You’ll see what I mean soon. 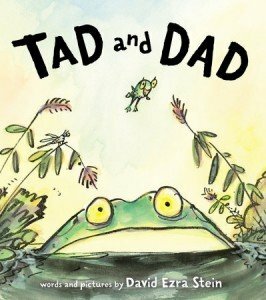 Tad and Dad is written and illustrated by Caldecott Honor winner David Ezra Stein, (Nancy Paulsen Books; $16.95, Ages 3-5). Tad the tadpole loves his dad, lots. He wants to be just like him, whether it’s making singing sounds in an echoing BUUURRPP or splashing sounds on touchdown after reaching new heights by jumping. Littles ones who have this endearing picture book read to them will also relate to Tad the tadpole wanting to spend the night beside his dad on the same lily pad. 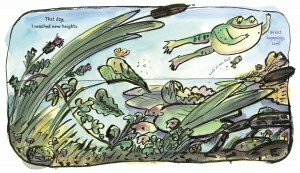 Trouble is, Tad’s growing up pretty fast and, as he grows, he naturally occupies more space … on his dad’s lily pad! Interior artwork from Tad and Dad written and illustrated by David Ezra Stein, Nancy Paulsen Books, ©2015. That means that at bedtime, when he asks to hop up next to Dad, any movement he makes is bound to be felt by his dad. And lately Dad’s been feeling sleep-deprived and exhausted. Kinda sounds familiar, huh? But when Tad offers to sleep all by himself on his own lily pad, Dad realizes he actually has more trouble getting to sleep without Tad by his side. 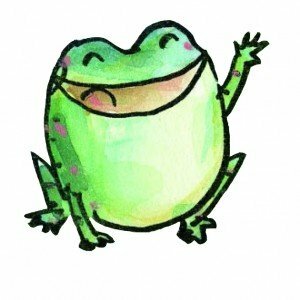 This heartwarming tale of froggy affection makes its point effectively in a most delightful Stein way. That means with humor, whimsical artwork and most of all, with love. 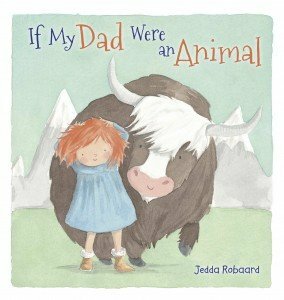 If My Dad Were an Animal is written and illustrated by Jedda Robaard, (Little Bee Books; $14.99, Ages 4-7). 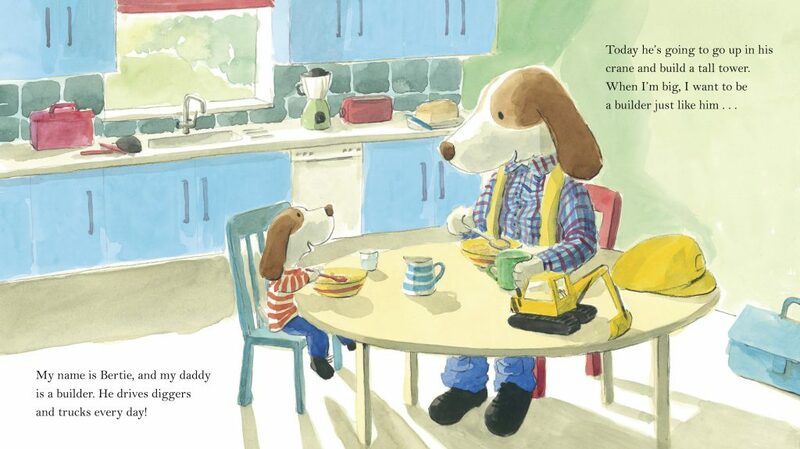 With very few words, this sweet picture book succeeds as a tribute to the many qualities that dads possess. Last month I reviewed If My Mom Were a Bird for Mother’s Day. The big difference in this companion book is that in If My Dad Were an Animal, boys and girls compare their dads to an assortment of animals. Some are like a “great, big, hairy … yak.” Or maybe stylish like a penguin. wise like a hooty owl or strong and burly like an elephant. 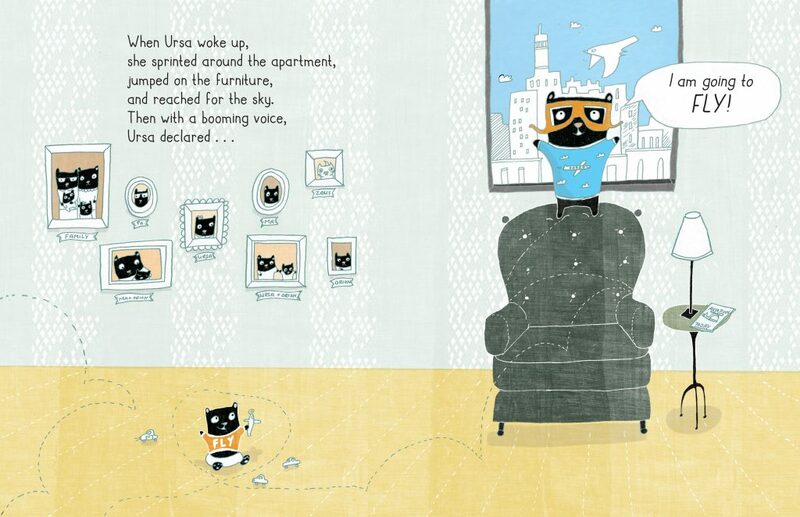 Interior artwork from If My Dad Were an Animal written and illustrated by Jedda Robaard, Little Bee Books ©2015. What works so well in this story is that Robaard has included each dad in the spread when the animals are revealed making it easy to show the comparison with very young children. Her watercolor illustrations are not overly embellished, but don’t need to be because all her creatures are adorable and full of personality. Parents can engage their youngsters with this tale by inviting them to think up more animals and characteristics they share with dads. The colorful pages of text contrast beautifully with the vast white space Robaard has intentionally left in order to draw attention to the child imitating his or her dad (see above). 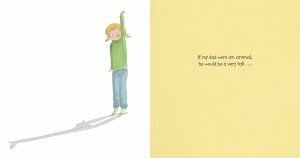 All in all, If My Dad Were an Animal is an ideal picture book for Father’s Day and everyday. 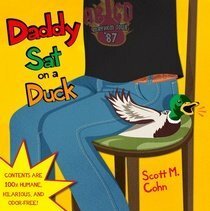 Daddy Sat on a Duck is written and illustrated by Scott M. Cohn (Little Brown Books for Young Readers; $15.00, Ages 3-6). Read the review, then scroll back up to enter Cohn’s hysterical giveaway here. I deliberately put the giveaway at the top because I absolutely love it and wish I could enter! It’s witty, quirky and seems to target the free range parent just like his debut picture book. The book opens with a *Note to reader: Try making the noises. You won’t be disappointed. And after reading the first two spreads, I dashed off to show my husband that there was someone else with his sense of humor. The fact that they’re both New Yorkers helps, but you don’t have to be from the Big Apple to find yourself laughing out loud at lots of the main character’s lines. Cohn has created an offbeat picture book that should definitely not be designated a Father’s Day book because it’s simply too funny to take out only once a year for the holiday. In this tale, the narrator, a little girl, keeps hearing the call of the wild (daddy), in other words, sounds such as farts, yawns, or howls that could easily be mistaken for lions, hippos, and other feral creatures big and small. I was starting to feel like I lived in a zoo. So I asked my best friend if she felt that way, too. She said, “Only once” — when her mom saw a mouse. In reality, she’s hearing the daily noises emanating from her father’s body, noises that eventually she learns to accept as part and parcel of being around her terrific loving dad. In addition to appreciating Cohn’s clever rhyming text, readers should scan his illustrations (created using Adobe Illustrator and Adobe Photoshop) several times so as not to miss even the smallest of details. My particular faves are illustrations of Uncle Johnny and Daddy singing and playing bass and guitar to Tom Petty’s Free Fallin,’ a penguin at the piano and Golden Doodle Louie with his shredded toilet paper tube. I’m happy Cohn’s tackled the topic of noises AND smells candidly and comically, and now look forward to what he does in his next book, Daddy Said a Word I Never Heard due out in the fall. One of my favorite holidays is Mother’s Day. I get to kick my feet up, relax, and get spoiled for several blissful hours. Okay, who am I kidding? That actually doesn’t really happen chez moi, but that’s not what Mother’s Day is about anyway, is it? Love is really at the core of this special day. 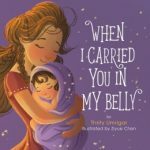 Let’s look at some picture books that celebrate all kinds of moms in all kinds of ways, because no mom is the same and we wouldn’t want it any other way. Are You My Mommy? 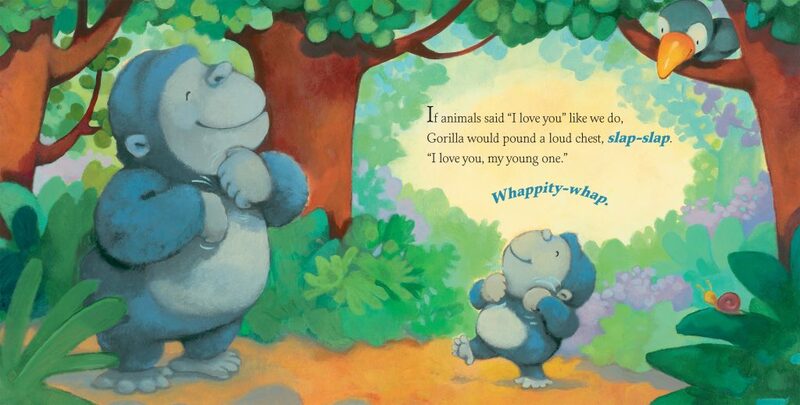 by Mary Murphy (Candlewick; $6.99, Ages 0-3) – This lift-the-flaps board book features an adorable little light blue collared puppy meeting lots of different animals as he asks, “Are you my mommy?” Naturally, each animal encountered replies no and explains what animal he is. “No, I’m a sheep.” The reveal is each animal’s own special baby, from a lamb to a calf, a foal and a kitten, a piglet and a duckling until the most lovely surprise, the puppy’s mommy, a purple collared dog. As little ones enjoy the colorful illustrations done in mixed media with bold black outlines, they’ll learn new words and have fun lifting all the die-cut flaps. listening to a song I just made up. Mom School is a sweet, positive picture book not just for Mother’s Day because the skills moms acquire at this school are utilized throughout the year. The adorable, humorous pastel-toned artwork by Burris is expressive and cheerful. Kids are going to enjoy thinking of other classes that their moms are likely to have attended and perhaps, inspired by Van Slyke’s words and Burris’ illustrations, they can try their hand at drawing their own pictures to show all the neat things moms know. If My Mom Were a Bird by Jedda Robaard (Little Bee Books; $14.99, Ages 4-7) – is such an imaginative, beautiful picture book. “If your mom were a bird,” it says on the book’s back cover, “what kind of bird would she be?” There is not a lot of text in this picture book, but the economy of words works wonderfully because the type of bird each child imagines their mother would be is perfectly presented in the artwork. If my mom were a bird, she would surely be a watchful … hawk. Interior artwork from If My Mom Were a Bird by Jedda Robaard, Little Bee Books, ©2015. capturing the mood without a lot of description. As with Mom School, If My Mom Were a Bird is a year round story, but also just right to share on Mother’s Day. Heather Has Two Mommies by Lesléa Newman with illustrations by Laura Cornell (Candlewick Press; $16.99, Ages 3-7) – This is a brand-new edition of the modern classic. And for Mother’s Day, what’s better than having one mom? Having two!! There are many different kinds of families and the family depicted in Heather Has Two Mommies is a family unit made up of two moms, no dad. What counts in families is not being just like every other family, but being loved. And in a classic example of actions speaking louder than words, Pete composes a song and plays it for his parents. He rocks it out of the park and right into their hearts.